Notes: This nymph, also known as the Brown Forked Tail, can be used in lakes or streams. It was originated by Doug Prince of Monterey, CA in 1941 for fishing has favorite stream, the Kings River. The above recipe is the actual original pattern described by Doug Prince. 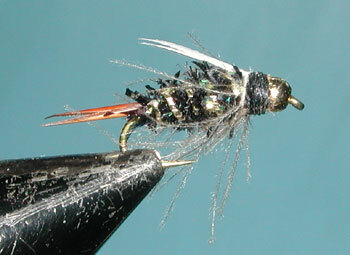 However, Skip Morris indicates in his book "The Art of Tying the Nymph", that Doug Prince actually used Black Ostrich Herl instead of Peacock Herl for his original pattern. 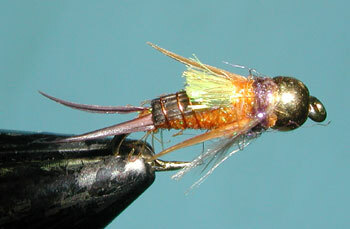 The Peacock Herl is the better choice as the material provides a very attractive irridescence to the body and has proven to be an excellent body material on other flies, such as the Zug Bug. Usually the white turkey biots used for the wing are turned down. However, in the orginal pattern, the wings were turned upwards. 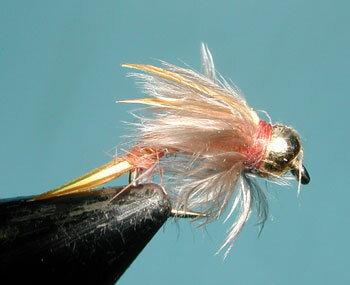 Often this fly is weighted using a beadhead and/or leadfree wire. When using a beadhead a 3XL nymph hook, such as the TMC 5263, can provide some extra room for the beadhead. A few wraps of Leadfree wire can also be used to fill the void of the bead. Substituting turkey biots with goose biots is also often done for the larger hook sizes. Keep in mind that the tail should be about half the shank length and the wings should extend from the head to the tail tie-in position. Both the tail and wing should have a narrow symmetrical angle in which the wing tips are just beyond the width of the body. When selecting the biots, note that the biots at the end of the quill tend to be narrower than those near the base of the quill. The narrower biots are often preferred for the tail materials while the wider biots are preferred for the wings. 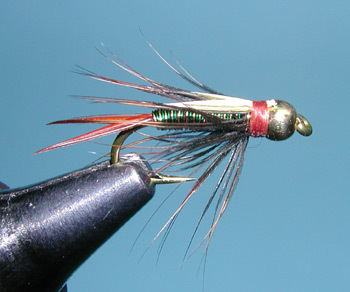 A hackle collar should not extend beyond the point of the hook. The hackle can be tied as a full collar behind the bead or eye of the hook or it can be tied as a beard to the underside of the shank just below the wing tie-in position. 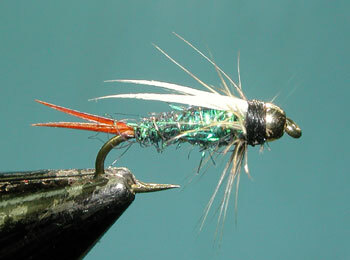 A nice variation (CDC Prince Nymph) is to use CDC for the collar hackle, this tends to give the fly a wispy action. 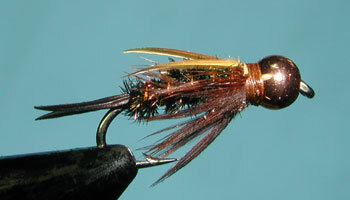 Tie the CDC in by the tip and give 2-3 wraps before securing the wing biots. Try to keep the CDC fibers from exceeding the end of the body by pinching off the excess. Other Variations include: Mercer's Psycho Prince Nymph, GB Lite Brite Prince Nymph, TB Hotwire Prince, Fred Gordon's Prince Nymph, King Prince, and Queen Prince. The Gold Bead Lite Brite Prince became quite popular within the Northwest during the 1980's and has moved its way south into the Sierras. Popular colorations are Copper, Blue/Olive, and Dark Olive. The Lite Brite provides a nice flash attraction with the white contrast of the biot wings. 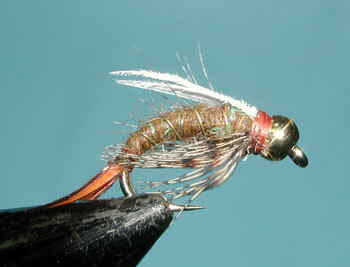 It is often used as a beadhead nymph attractor in freestone streams. The King Prince and Queen Prince are recent variations introduced by Idylwilde Flies and distributed to a number of Sierran Fly Shops. Using a scud-type hook, it is considered to be a better fast water variation. Both use hackle materials that provide plenty of movement from the Partridge throat hackle on the King Prince and the full collar hackle of a Partridge Aftershaft quill on the Queen Prince. When Wapsi introduced it's colored copper wire, many patterns were adapted utilizing the wire for body patterns as seen in the TB Hotwire Prince. Mike Mercer's Psycho Prince is a recent variation utilizing many synthetic materials such as Ice dubbing, Angel Hair, and Z-lon. The Orange ice dubbing body gives the fly a great attractor element as well as the Electric Banana Angel Hair which represents the bursting wing case. Note how the wing splays outward, highlighting the wingbud. Mike maintains a sense of realism to his patterns by utilizing a turkey tail carapace that gives a dark/light contrast to the body, similar to the naturals. 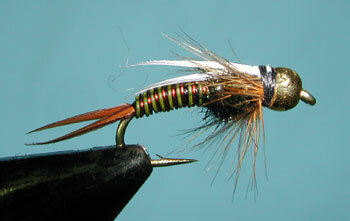 The pattern is also tied in larger sizes 6-12 for steelhead. Sierran Guide, Lance Gray came up with his variation, Amber Wing Prince. It uses the Green and Gold Hot Wires for the body, a Furnace Hen Hackle for legs, and an Amber Goose Biot for the wing. 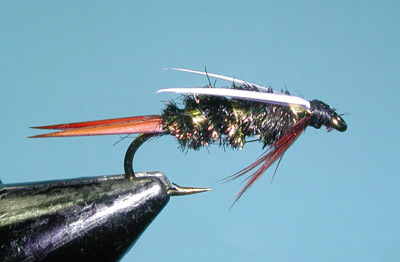 He left off any thorax material so that it could have the shape of an emerging caddis but the colorations will allow the pattern to be fished as a stonefly as well.